This is my third time in Croatia in the last 12 years or so, but the first time to the south and the Dubrovnik region. Twelve years ago people in the UK thought I was crazy coming here; most still considering it to be a war zone, Some still do, but prices in the Euro zone are making Croatia a financially attractive destination. That said, its not cheap in this particular city, and accommodation prices can be eye watering. The centre of Dubronik is of course the old walled city, and Croatia rightly considers this to be their jewel in their crown. The walled city is beautifully proportioned and laid out; you can walk across it in 10 minutes or wander round the lanes for hours. Pretty much the whole thing is given over to tourist activities and it does feel artificuial because of this – some of the areas on the periphery by the walls have houses, but many of these are holiday rental flats. 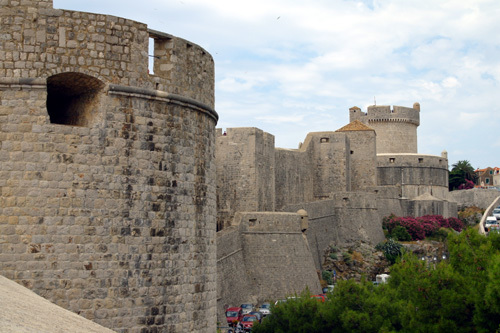 Within the walls most of what you are looking at is restored, or at the very least cleaned up in some way; Dubrovnik was under siege and shelled 1991 – 92, The most extensive damage was to the roofs, which are almost all new (some older sections survive near the old port). No one seems to want to talk much about what went on in the early 90’s, not even gudebooks, which barely mention it whilst spending a lot of words explaining the Republic of Ragusa, the French invasion of 1808 and the subsequent aquisition by the Austro-Hungarian Empire. Similarly Tito barely gets a mention; history is written by the victors and I suppose some of this recent history is still a bit painful. Despite the reticence for discussion, there is however a specialist photography gallery in Dubrovnik, and it’s well worth a visit. The gallery features permanent and visiting collections: War Photo Limited, full details on their website here. 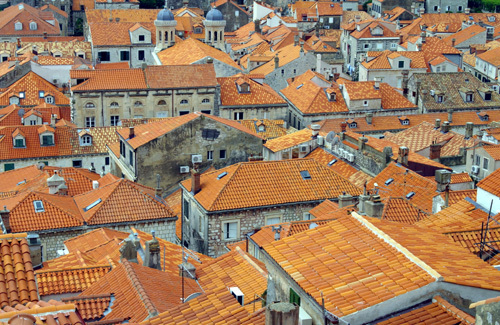 I don’t know what Dubrovnik was like before the shelling, but one legacy is that the look of the place is cohesive, well planned and coordinated – something that most cities don’t get a crack at. The buildings are for the most part unadorned, just natural limestone, with all the woodwork a dark green, street lights are all the same, advertising is very low key with few shop or cafe signs (most of the cafe umbrellas are plain) which all adds to the cohesive look of the town; the result is very attractive and calm. Most of the ‘must sees’ are within the city walls, beginning with the city walls themselves – probably the number one attraction. Current pricing is Kn70 (€9.5) per adult (which seemed to shock a few people), for this you get to walk around the approx’ 2km of city wall and get some fantastic views. The walls on the land side are especially impressive and give some idea of the amount of defense the builders thought was necessary. 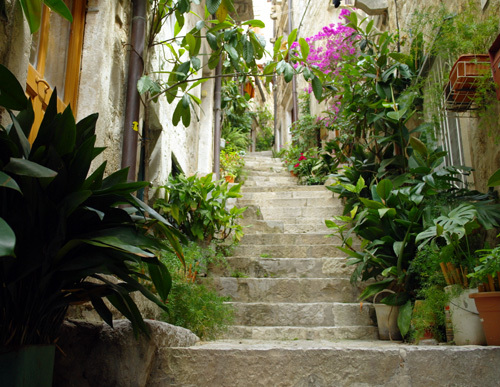 Some parts of the walls involve quite steep climbs – this is not pointed out at the entrances so be aware, some people were struggling – especially in the heat. There are a couple of cafe stops on the seabourne side, but otherwise little shade or places to rest. 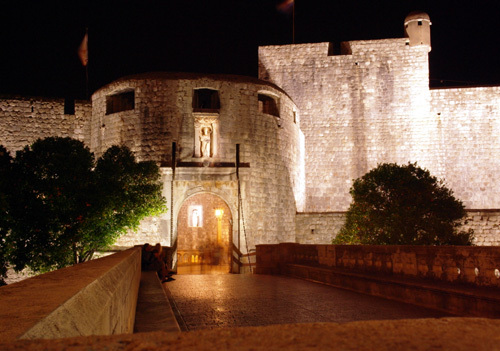 The Rector’s Palace (home of the old rulers) is the second ‘must see’, now a museum it contains a few items of interest, including a photographic exhibition of the seige (this may not be a permanent exhibit but should be). 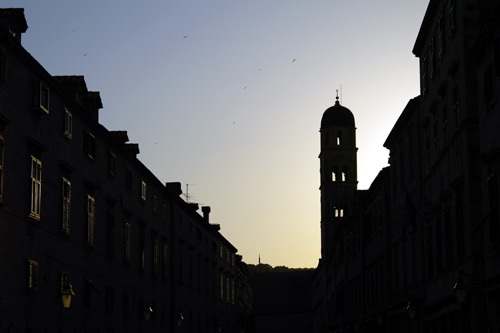 The whole Stari Grad (old town) is a museum really – and wandering about is free. If you want to see all the museum exhibits or are staying for a few days it might be worth considering a ‘Dubrovnik Card’. These are valid for 1,3 or 7 days. The 7 day card was about Kn220 and included the City Walls and 7 other attractions, as well as 20 rides on local buses. Not only is this good value it saves messing about with coins for buses. 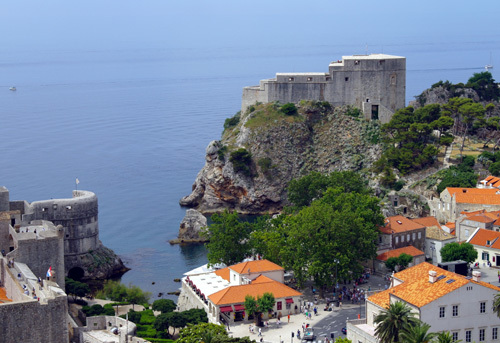 As the old town is very compact Dubronik has long since burst its walls and spread along the coast both sides of the city. To the north lie the areas of Gruz (port area), Lapad and Babin Kuk. Lapad houses the highest concentration of smaller hotels and apartments, with a few large resort hotels on Babin Kuk.The beaches are also out on the Lapad/ Babin Kuk peninsua (there is also a small beach near the old town). The beaches may not be what you are used to… Some of those marked on maps are little more than rocky promenataries, and whilst spectacular to look at they are frankly rather uncomfortable and offer no shade; oh, and one more thing, clothing optional. There are some more organised beaches such as Copacabana, where beds, unbrellas and water sports equipment can be rented. Copacabana beach has a cafe where simple meals and drinks are available too. 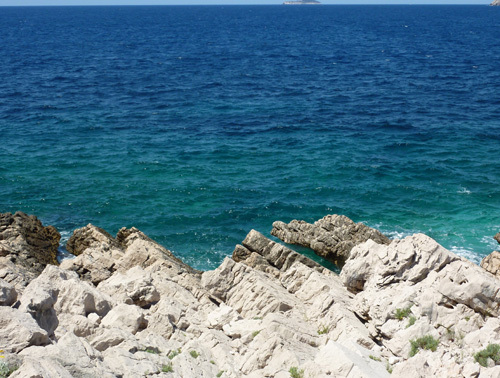 The water around Dubrovnik is spectacularly blue, sometimes emerald green and blue – the most amazing colours I have every seen anywhere. One reason for this is the clear water; there is little sand – most of the beaches are rocky or gravelly, this doesn’t cloud the water. 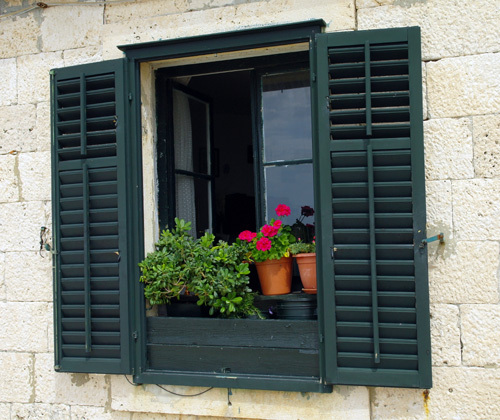 Getting around: As the large hotels are very expensive, you may well be staying a little out of town. As above, Lapad is a poular area and there are a couple of options in Gruz, whilst these may seem ‘out of town’ it’s not a problem thanks to the efficient bus network. One way or another you are probably going to have to travel: either to the beach or the town, so as long as you are near a bus route it’s not a problem. 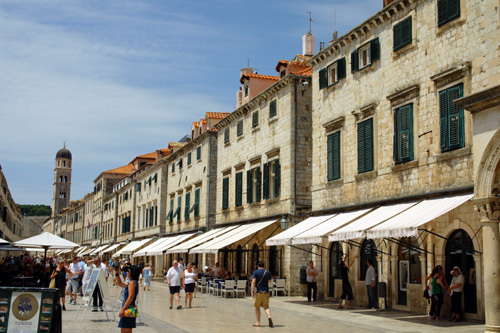 Both Gruz and Lapad have plenty of local facilities for shopping and eating too – so you won’t have to go to the Old Town every night if you don’t want to. Food and drink: When I first came to Croatia about 12 years ago the only difference between restaurant offerings was the price; I’m happy to report that this situation is resolved: now they all charge the same. At least half the restaurants in the old town have a menu centered on pizza and pasta, with an occasional grilled fish thrown in. Some offer grilled steak, and some feature Octopus Salad as if this were a truly great addition to world cuisine. The food is OK, I have not had a bad meal, but the lack of choice and variety is astounding; after a week here I am craving something different.The national dish is called Cevapcici (apologies for the lack of punctuation – it should have a lot), which is advertised as a spicy meatball with a spicy paprika dip; its a meatball? yes… spicy? no… not to someone who eats Indian at least once a week. My guidebook states that ‘Dalmatians don’t eat out, unless for business reasons’… well there we have it; this is a nation not much interested in food – apart from as fuel. Prices in the old town are 30 – 50% higher than elsewhere and I strongly suspect one restaurant of the most heinous crime known to man: watering down the wine… I can tell, I’ve shifted enough. One thing that they are very good at here is ice cream; good quality and huge range of flavours. However, I did see a rather odd display in an ice cream parlour (why is ice cream sold in ‘parlours’, not shops? ), behind the counter on a huge TV screen was an infomercial about how the ice cream was made – it all looked very factory and industrial, and not at all the kind of image we would use to sell a ‘natural product’ in the UK. Summing up: great place for a week long break, stunning setting and good location for onward trips. Coming up next: Europe’s newest country – Montenegro.